This is a sample form of personal book of pleas to the 42 deities written and buried with a deceased and used in ancient Egypt from 1550 to 50 BC (more than 110 years before the Ten Commandments and the Torah). The purpose of book of the dead was to help in judgement to pass from death to light. It is also called the 42 Negative Confessions. Maat or Ma’at refers to both the ancient Egyptian concepts of truth, balance, order, harmony, law, morality, and justice, and the personification of these concepts as a goddess regulating the stars, seasons, and the actions of both mortals and the deities, who set the order of the universe from chaos at the moment of creation. In the Duat, the Egyptian underworld, the hearts of the dead were said to be weighed against her single “Feather of Ma’at”, symbolically representing the concept of Maat, in the Hall of Two Truths. This is why hearts were left in Egyptian mummies while their other organs were removed, as the heart (called “ib”) was seen as part of the Egyptian soul. If the heart was found to be lighter or equal in weight to the feather of Maat, the deceased had led a virtuous life and would go on to Aaru. Osiris came to be seen as the guardian of the gates of Aaru. 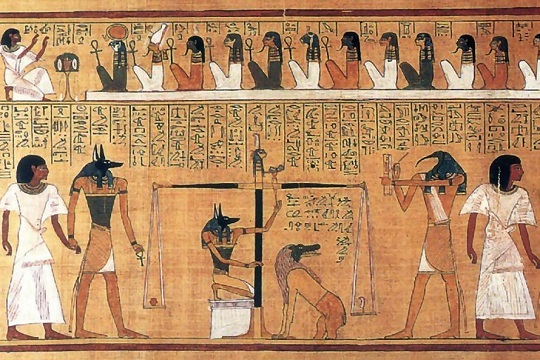 The weighing of the heart, pictured on papyrus in the Book of the Dead typically, or in tomb scenes, shows Anubis overseeing the weighing and the lioness Ammit seated awaiting the results so she could consume those who failed. The image would be the vertical heart on one flat surface of the balance scale and the vertical Shu-feather standing on the other balance scale surface. While the heart was weighed the deceased recited the 42 Negative Confessions as the Assessors of Maat looked on. Hail, Usekh-nemmt, who comest forth from Anu, I have not committed sin. Hail, Hept-Shet, who comest forth from Kher-aha, I have not robbed with violence. Hail, Fenti, who comest forth from Khemenu, I have done no violence. Hail, Am-khaibitu, who comest forth from Qerrt, I have not stolen. Hail, Neha-hau, who comest forth from Rasta, I have not slain men. Hail, Ruruti, who comest forth from heaven, I have not made light the bushel. Hail, Arti-f-em-tes, who comest forth from Sekhem, I have not acted deceitfully. Hail, Neba, who comest and goest, I have not stolen the property of the god. Hail, Set-qesu, who comest forth from Hensu, I have not told lies. Hail, Uatch-nesert, who comest forth from Het-ka-Ptah, I have not carried away food. Hail, Qerti, who comest forth from Amenti, I have not uttered evil words. Hail, Hetch-abhu, who comest from Ta-she, I have attacked no man. Hail, Unem-snef, who comest forth from the execution chamber, I have not salin a bull which was the property of the god. Hail, Unem-besku, who comest [forth from the Mabet chamber], I have not acted deceitfully. Hail, Neb-maat, who comest forth from Maati, I have not pillaged the lands which have been ploughed. Hail, Thenemi, who comest forth from Bast, I have never pried into matters [to make mischief]. Hail, Aati, who comest forth from Anu, I have not set my mouth in motion. Hail, Tutuf, who comest from from A, I have not been wroth except with reason. Hail, Uamemti, who comest forth from the execution chamber, I have not debauched the wife of a man. Hail, Maa-anuf, who comest forth from Per-Menu, I ahve not polluted myself. Hail, Heri-uru, who comest forth from [Nehatu], I have terrorized no man. Hail, Khemi, who comest forth from Ahaui, I have not made attacks. Hail, Shet-kheru, who comest forth from Uri, I have not been a man of anger. Hail, Nekhem, who comest forth from Heq-at, I have not turned a deaf ear to the words of truth. Hail, Ser-Kheru, who comest forth from Unes, I have not stirred up strife. Hail, Basti, who comest forth from Shetait, I have made none to weep. Hail, Her-f-ha-f, who comest forth from thy cavern, I have not committed acts of sexual impurity, or lain with men. Hail, Ta-ret, who comest forth from Akhkhu, I have not eaten my heart. Hail, Kenmti, who comest forth from Kenmet, I have cursed no man. Hail, An-hetep-f, who comest forth from Sau, I have not acted in a violent or oppressive manner. Hail, Neb-heru, who comest forth from Tchefet, I have not acted [or judged] hastily. Hail, Serekhi, who comest forth from Unth, I have not…. my hair, I have not harmed the god. Hail, Neb-abui, who comest forth from Sauti, I have not multiplied my speech overmuch. Hail, Nefer-Tem, who comest forth from Het-ka-Ptah, I have not acted with deciet, I have not worked wickedness. Hail, Tem-Sep, who comest forth from Tetu, I have not done things to effect the cursing of [the king]. Hail, Ari-em-ab-f, who comest forth from Tebti, I have not stopped the flow of water. Hail, Ahi-mu, who comest forth from Nu, I have not raised my voice. Hail, Utu-rekhit, who comest forth from thy house, I have not curse God. Hail, Neheb-Nefert, who comest forth from the Lake of Nefer, I have not acted with insufferable insolence. Hail, Neheb-kau, who comest forth from [thy] city, I have not sought to make myself unduly distinguished. Hail, Tcheser-tep, who comest forth from thy cavern, I have not increased my wealth except through such things are [justly] my own possessions. Hail, An-a-f, who comest forth from Auker, I have not scorned [or treated with contempt] the god of my town.